I’m Lydia, or shearersgirl on Ravelry. I am joining Dawn to assist with Spinspiration now that Kelly has moved on. I thought as this is my first post over here I’d better introduce myself. I have been spinning, dyeing and shearing sheep for about four years. I became interested in wool when I discovered fleeces were being burnt or left to rot because they had so little value. As someone who hates waste, I was horrified. I went on a shearing course, bought a spinning wheel and joined the Guild. I am a member of the Kent Guild of Spinners, Dyers and Weavers. Now I also run a small business, Shearer Girl Yarns, selling my hand dyed yarns and fibre from local farms. I love working with natural fibres and natural dyes. People often ask if I have my own sheep or live on a farm, sadly neither is true – maybe one day. I can also be found writing for Yarnmaker magazine and I’m on Twitter @Romneyteg. 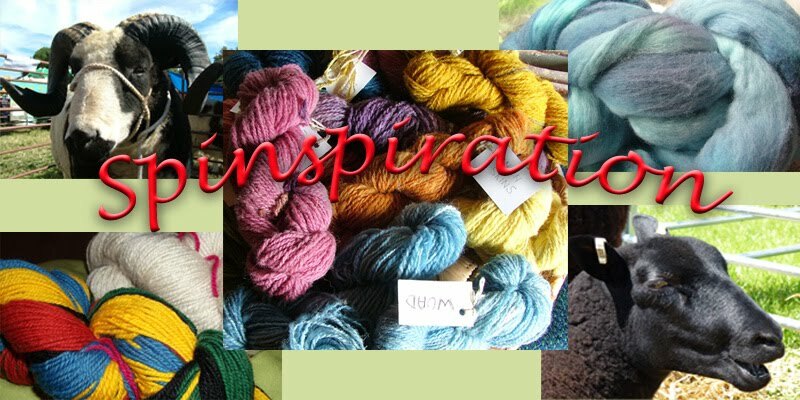 I’m looking forward to taking part in Spinspiration and hearing about your fibre adventures! Here is my spinning story. I started spinning four years ago. I am horse mad and I have always had an interest in farming so I was volunteering at the Working Horse Trust, a charity which promotes traditional heavy horse breeds. As part of the grassland management system, the trust has a small flock of Southdown sheep. I helped out a bit at lambing time and enjoyed a few Southdown sausages but didn’t have a lot of contact with the sheep. When I saw the flock’s fleeces abandoned to rot in a barn, I was horrified. I thought maybe I could learn to spin and do something with all this wool. I also thought I could save the charity some money by learning to shear. So I came to shearing and spinning at the same time. I went on a shearing course, then a few weeks later I was at the Kent County Show and wandered into the tent of the Kent Guild of Spinners, Dyers and Weavers. I was fascinated to watch the ladies spinning and see all the colourful things they had made. I kept going back to their tent. Eventually, one of the spinners asked if I would like to have a go. I did and was hooked. Janet said afterwards she knew I must have been keen because I kept coming back! I was helping out on shearing jobs that summer. One of the shearing customers had an Ashford Traditional wheel, still in pieces in its box, tucked away. I bought the brand new wheel for a good price, along with carders, a niddy noddy, lazy kate and a video. I lovingly waxed my wheel and put it together but it would not spin. I was in despair. I took my wheel to a Guild meeting and explained my dilemma. A huddle of ladies appeared around me making all sorts of suggestions and within minutes they had my wheel set up and spinning. I got a Portland fleece from a shearing job and washed it without sorting it because I didn’t know anything about sorting fleece. I dyed some of the fleece with Dylon dyes and felted a fair portion by accident. I carded the wool by hand and spun lumpy yarn. Eventually I spun enough to make a jumper. 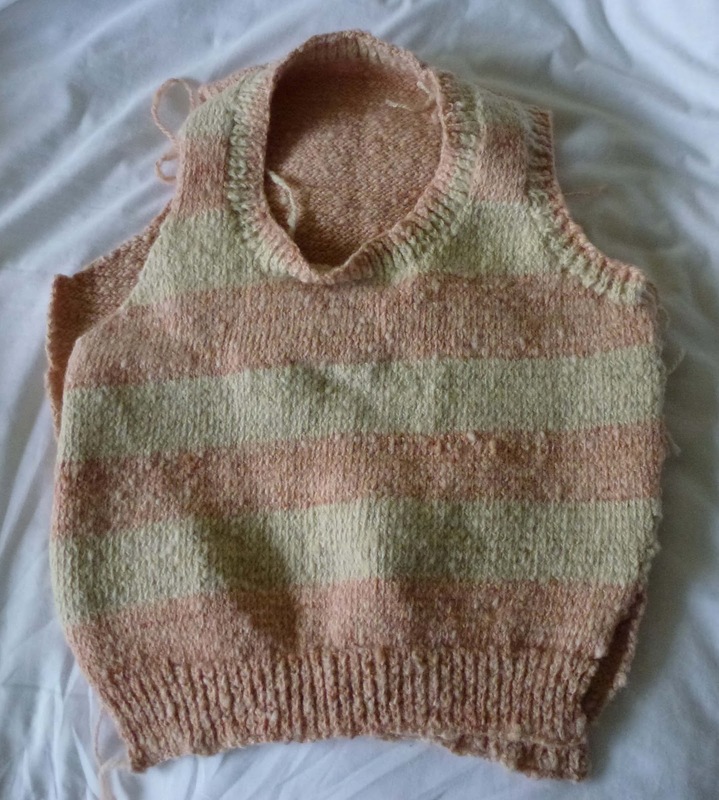 A bullet proof jumper - the yarn was so dense and over spun. In the meantime, I decided fleece washing was a tedious business and so I flung my second fleece, a Black Welsh Mountain, in the washing machine. Again, I hadn’t sorted the fleece, nor had I noticed the hardened clumps of poo attached to the bottom end. The poo softened in the wash and distributed itself throughout the fleece. 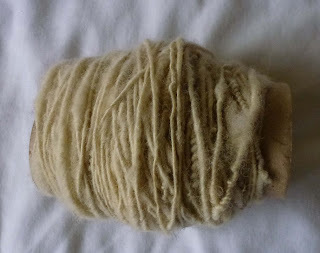 Being forgiving Welsh Mountain, the fleece didn’t felt and I did manage to spin some. Since then, I’ve learned by trial and error, reading books and by watching fellow Guild members. These days I also learn a great deal through online resources, such as Spinspiration!